Jupiter transit to Libra 2017 prediction for Virgo Sign - Guru peyarchi palangal 2017 for Kanni Rasi as per Thirukanitha Panchangam. Let us analyze Guru Peyarchi 2017 prediction in detail for Kanni Rasi, so we can know what to expect. Those born under any of these stars have Virgo as their moon sign. Virgos have an attractive personality, witty speech, lyrical and interested in the arts. This moon sign is ruled by Lord Mercury. Lord Jupiter brings good outcomes for Virgo and rules the Houses of relationship and career for Virgos. But, depending upon which House Lord Jupiter resides, a few malevolent consequences will be seen. Last year, Lord Jupiter had transited to the House of Virgo on August 2, 2016. This year, He transits to the House of Libra on September 2, 2017, and stays there until October 4, 2018. Let us have a look at what the transition had brought you last year. Students had to change their schools or colleges. Many hurdles came in the way of their academics. Those at work faced many changes like change of job or change of location, even their offices. Some had the opportunity to travel to faraway places due to their work. Those expecting marriages or childbirth had their wishes fulfilled. Lord Jupiter now transits to the House of Libra on September 2, 2017. Let us look at what this transition will bring to you Virgo sign. Planet Jupiter transiting to your 2nd House, the House of Libra is very favorable to you. The 2nd House deals with money or income. Money flow will be quite good. Any outstanding loans will be repaid back to you. Your income will increase suddenly. As the 2nd House deals with the family too, you will spend your money on joyous occasions in the family. You will be victorious in everything you undertake. From Libra, Jupiter aspects your 6th, 8th, and 10th houses of Zodiac. 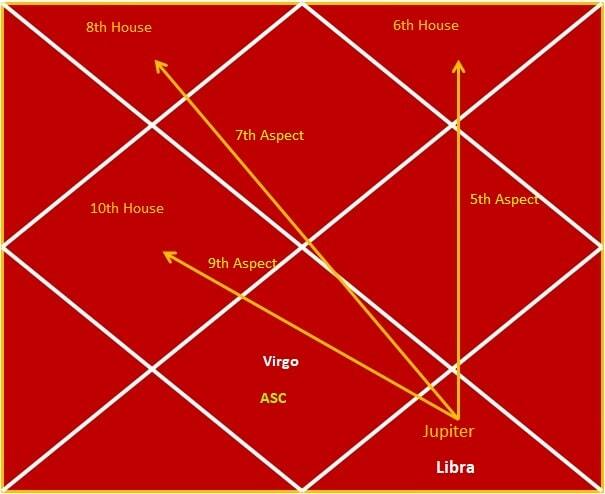 Lord Jupiter aspects the House of Aquarius (your 6th House) which is called Roga Sthanam. The 6th House deals with your health, court cases, litigation and conflicts. Any health problem afflicting you will be cured. Accidents and surgeries will be prevented from occurring. Your enemies will weaken. Debts will start to vanish. You will win your court cases. Jupiter (Guru) aspects the House of Aries (your 8th House). The 8th House deals with longevity and Mangalya Sthana for women. Any life threatening disease will vanish. Your health will be restored for the better. Women will have their Mangalya strengthened. Planet Guru (Jupiter) aspects the House of Gemini (your 10th House). The 10th House deals with career. Unnecessary travelling, stagnant business and such troubles will go away. You will get the opportunity to start new ventures. As your work increases, your money flow also increases. Overview of the Jupiter transit this year for you Virgo sign. Students will excel at their studies and score good marks. Those awaiting marriages or childbirth will have their dreams come true. You will gather money and gold. No obstacles come in way of money flow. Your longstanding loans will be recovered. Celebratory occasions will rise in your family. Your children will succeed in their arena of life. Pilgrimages and charitable work will proceed successfully.